Most Americans have some concerns that self-driving cars can be hacked to cause crashes, disable the vehicle in some way or even be used as weapons by terrorists, according to researchers at the University of Michigan. And large percentages of people are at least slightly concerned that these kinds of vehicles can be hacked to gain access to personal data. However, more than half have these same cybersecurity concerns about conventional vehicles, say Michael Sivak and Brandon Schoettle of the U-M Transportation Research Institute. Using an online survey of more than 500 Americans, the researchers asked respondents how concerned they are about hackers gaining access to personally owned self-driving (both with control over the gas pedal, brake and steering, and without) and conventional vehicles. 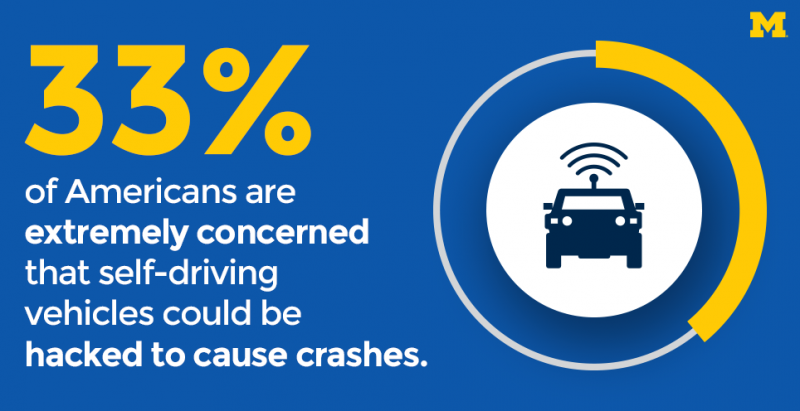 They found that 76-88 percent of people are at least slightly concerned that self-driving vehicles could be hacked to cause crashes, or disable many vehicles simultaneously or the vehicles' main traffic-management systems. More than 40 percent are very or extremely concerned. But even with regard to current conventional vehicles, about a third of respondents are at least somewhat concerned that hackers could cause crashes, disable vehicles or use them for acts of terror, or gain access to personal data. "Hacking of vehicles is even a concern for conventional vehicles," Sivak said. "But hacking of self-driving vehicles with controls is of greater concern, and hacking of self-driving vehicles without controls is an even greater concern." The researchers also found that women and older people have stronger concerns about cybersecurity.